Bake a Moist Caramel Apple Cake for your friends and family. Freshly chopped apples meet caramel scrumptiousness in this delicious recipe, and with 16 servings, you'll be able to serve everyone your caramel apple cake. Beat first 6 ingredients in large bowl with mixer until blended. Stir in apples. Pour into greased and floured 12-cup fluted tube pan or 10-inch tube pan. Bake 50 min. to 1 hour or until toothpick inserted near center comes out clean. Cool cake in pan 15 min. Loosen cake from sides of pan; invert onto wire rack. Gently remove pan. Cool cake completely. Transfer to plate. Microwave caramels and milk in microwaveable bowl on HIGH 1-1/2 min. or until caramels are completely melted and sauce is smooth, stirring every 30 sec. Cool 10 min. or until slightly thickened. Drizzle over cake just before serving. 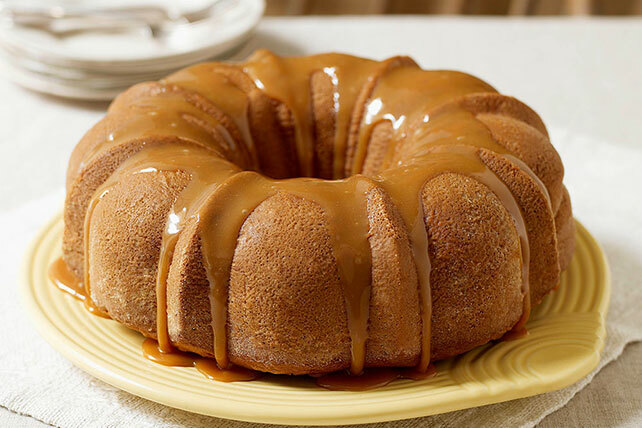 To avoid soggy cake, drizzle caramel sauce over cake just before serving. Prepare using JELL-O French Vanilla Instant Pudding.